It's extremely rare that a comet close to the Sun is spotted during a total eclipse of the Sun - it happened in 1882, when the comet was indeed close to the Sun (as a Kreutz Sungrazer), and in 1948. And in 2008: The SOHO spacecraft had already discovered and tracked the - this time pretty faint - comet, and observers of the eclipse were alerted the day before (if they still got e-mail whereever they were). Searches for this comet in even the best wide-angle images of the eclipse have been in vain, however - until now: in the spectacular wide-field composite already mentioned not only a lot of stars are visible but the comet has been identified! Looking just like a star, but the community is celebrating. In other comet news comet 205P/Giacobini - recently recovered after 111 years and 16 perihelia in which it was not seen - has actually broken into at least 3 parts: The breakup may actually be the cause of the recovery because it increased the comet's brightness significantly. Here are an image of a fragment and animations; smaller optics don't show the smaller fragments. 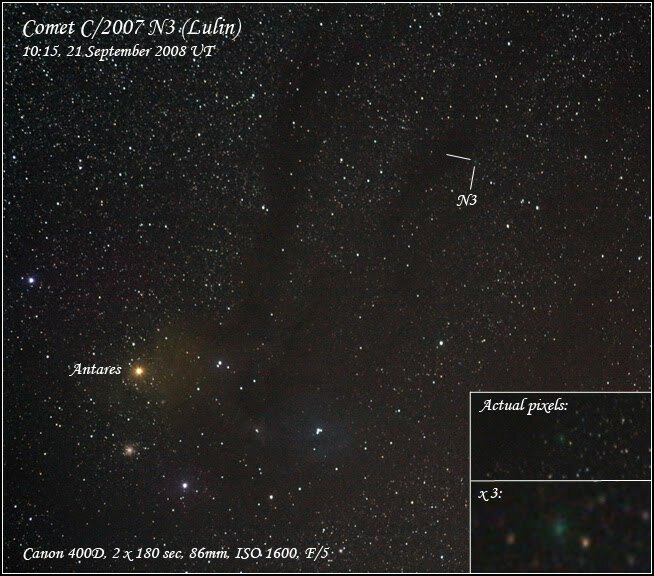 • Also a wide-field view of comet Lulin. In news on other topics fireballs over the British Isles have been sighted. • The old nova GK Per is in outburst, having risen to 12 from the normal 13 mag. • And the small cycle 24 sunspot group, perhaps celebrated prematurely, is already gone again. While the Ulysses spacecraft is actually doing better than reported! "Dwarf planet" to be replaced by nicer word? Now all five dwarf planets have real names!